Saginaw Bay began her wartime duties in April 1944, transporting aircraft across the Pacific. She then provided air cover for the invasion of the Palau Islands in August 1944. Next, Saginaw Bay was assigned to Taffy 1, guarding the southeast entrance to Leyte Gulf. The Battle for Leyte Gulf, part of the larger Battle off Samar, was one of the most epic naval battles in history. 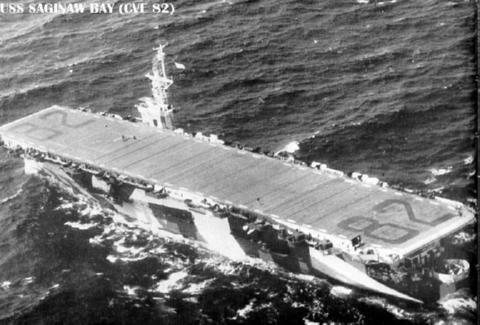 Saginaw Bay did not participate in it, but unloaded her aircraft and headed instead to Moro-tai to pick up replacements. The US, though greatly outnumbered, won the battle. Next, she picked up and attended to survivors from the explosion of ammunition ship Mount Hood in November 1944. Saginaw Bay sustained minor damage. Next, in January 1945, she supported the Lingayen Gulf invasion. From January to March, 1945, she provided air cover for the Iwo Jima invasion. Then, until late April, she supported the successful invasion of Okinawa. The carrier earned five battle stars for her accomplishments in World War II. She was ultimately sold for scrap in 1959.